Here is a picture of Maxi when she was full of life, we had such great time with her. 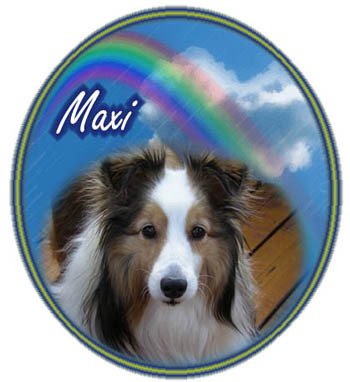 We said goodbye to Maxi March 23rd, 2009, we really enjoyed the 11 years she gave us and will remember her always. She was a great dog, and Sammy will miss her big sister. We do thank you for your tender loving care whenever we went away. We always left with the peace of mind that the girls were well taken care of. We really appreciated all you have done for us. For the past year, I have entrusted the care of my beloved dog to "For The Love of Pets". My dog would be taken for walks in my neighbourhood and safely returned home and then spoiled with treats and affection....As a veterinary health professional, I know the importance of reliable and responsible pet care as well as the importance of our bond with our pets. I whole-heartedly recommend this service to other pet lovers. Thank you "For The Love of Pets" for the peace of mind you have granted us for the past 4 years. When we decided to have someone take care of Rex with his injections in our absence, we were a bit nervous. But your staff has been extremely loving and caring to our diabetic cat. I am sure Rex will miss you. Keep up the good work and best of luck to you all. I moved to the Capital region a few months ago and was somewhat apprehensive about pet care in my new location. I used to rely on my friends and family to help me out when I went away, but I was not comfortable in imposing on my new friends here. This is particularly true, because one of my dogs has a particular personality and does not adapt to strange people or places easily. When I mentioned my dilemma to my vet one day, he told me that one of his patients had just tried "For The Love of Pets" pet sitting and was very pleased with their services. When I called "For The Love of Pets", they immediately put me at ease. Since I had never used this type of service, I was not sure how my dogs would react. But my dogs were treated with respect and now when I go away, I know they are happy and relaxed and so I am! We are very lucky to have found this service and would recommend "For The Love of Pets" as a safe and comfortable alternative to boarding. Chuck & I & Mesa & Bruno would like to extend a huge thank you for the terrific pet and house sitting service that was provided to us. We were impressed by the deep level of care shown for our animals and the care taken with out house… We will no doubt use your reliable and caring service again, when we escape the cold winter again!